A massive liquefied natural gas (LNG) export project in Canada received final approval by LNG Canada and its partners on October 2, making it the first major new project for the fuel to win approval in recent years. TransCanada (pipeline) Corporation also announced that it will proceed with construction of the Coastal GasLink pipeline project after the decision to go ahead by LNG Canada. The $6.2 billion project is a 670-kilometre (420 mile) pipeline that would transport natural gas from the Montney gas-producing region near Dawson Creek, B.C. to the LNG Canada facility in Kitimat on BC’s Pacific coast. First gas from the project is expected by 2024. The complex course through rocky islands out to sea was a factor in the cancellation of a planned oil pipeline to Kitimat, with delivery to awaiting huge oil tankers. The total project is estimated to cost $40 billion. Stakeholders in the project are Shell, Malaysia’s Petroliam Nasional Bhd (Petronas), PetroChina Co Ltd, Korea Gas Corp (KOGAS) and Japan’s Mitsubishi Corp.
“I believe we can create far more jobs in other industries that won’t drastically increase our emissions.”, added Weaver. Still, Weaver’s Green Party does not challenge capitalism. Weaver wants to manage capitalism better, not get rid of the system that puts profits before survival. He does not advocate nationalizing and rapidly phasing out hydrocarbons, as the NDP Socialist Caucus does. Nor does he advocate a publicly owned massive green energy system which could create tens of thousands of jobs and dramatically cut GHGs in short order. Horgan’s enthusiasm for the massive LNG project, matches NDP Premier Rachel Notley’s shrill advocacy of tar sands and pipelines in Alberta. Both demonstrate that the NDP leadership is deeply committed to the profits of the oil barons more than to the environment on which we depend for life. In its own statement, Mitsubishi said the total estimated development cost of the planned Kitimat LNG plant is about US $14 billion. The cost of the liquefaction plant and a 670-kilometre pipeline to connect gas to the plant will exceed 2 trillion yen (US $17.6 billion), a company official said. The project will create of a lot of jobs in Japan, apparently. The construction decision also comes amid a Sino-U.S. trade spat that has led to tariffs being imposed by China on LNG shipments from the United States, threatening U.S. President Donald Trump’s energy dominance plan. This project could bypass the Chinese tariffs. Premier John Horgan says his government is mulling ways to implement all of the tax giveaways and relief for the LNG Canada project without a vote in the legislature, a scenario that would avoid a showdown with the NDP’s power-sharing partner, the B.C. Green Party. In March, Horgan’s government promised LNG Canada about $5.3 billion in tax breaks. This leaves BC workers and the poor to carry the tax load while global capitalist corporations pay little or no tax. As expected, Wilkinson’s right wing Liberals issued a statement saying they have supported LNG from the outset and are looking forward to backing any legislation concerning the Kitimat project. Unnamed government officials said B.C.’s proposed climate plan will be designed to meet legislated targets to cut greenhouse gas emissions by 40 per cent by 2030, 60 per cent by 2040 and 80 per cent (or 13 mega tonnes) by 2050. Much of the reduction, they claim, will be achieved by B.C. moving towards electrification, primarily in the transportation and industrial sectors. The officials said the plan will offer industry rebates on carbon tax payments if they meet global clean-energy targets. But B.C. government staff are working based on LNG Canada’s claim that the project is forecast to emit 3.45 megatons of greenhouse gas emissions annually. By contrast, a Maclean’s magazine editorial stated that LNG Canada represents roughly 10 million tonnes of CO2-equivalent per year. This is one quarter of B.C.’s entire greenhouse-gas budget for 2030, or two-thirds of B.C.’s 2050 target. In other words, to meet B.C.’s emissions targets and serve LNG Canada, the rest of the province will need largely to decarbonize. So, the LNG development seems inconsistent with Canada’s commitment to climate action. How will a government that caves in to the hydro carbon giants, have the guts to force through such a massive change? Like virtually all GHG reduction targets set under capitalism, they come a distant second to the priorities of profit and accumulation of vast wealth by the capitalist class. Horgan in BC, the NDP government under Rachel Notley in Alberta, and Liberal Justin Trudeau in Ottawa will strive to ensure that this continues. Along with the massive Site C power dam decision, this LNG betrayal makes clear that the struggle to defend Indigenous rights and the environment is not centred in parliament. It should be powered by united mass action in the streets. In the Fall of 2016 left wing activists in the labour-based New Democratic Party of Canada launched an independent campaign to draft Sid Ryan, past president of the Ontario Federation of Labour, to run for Leader of the federal NDP. On a website, the campaign team posted a 17-point socialist policy platform to serve as the basis for his candidacy, and to influence all registered candidates in the race for NDP Leader. Over 20,000 people visited the site to read the policies and to see videos featuring Sid speaking on political issues. For personal reasons, Sid decided on April 26, 2017 not to run. We respect his decision. Still, the need for socialist leadership and a new direction for the NDP is urgent. Liberal Prime Minister Justin Trudeau, the new Conservative Party leader Andrew Scheer, and most of all, the big business ruling class must be challenged from the left. To advance that prospect the NDP Socialist Caucus decided to pose 10 Questions, to challenge the registered candidates to state clearly where they stand on those issues and the 17-point platform. Based on the responses we get, the Socialist Caucus will seriously consider whether to support one or none of the contenders. At the same time, the SC continues to protest the undemocratic entry fee and rules imposed by NDP officials that unduly restrict who can run. The NDP Socialist Caucus, founded in 1998, is the organized left wing of North America’s only mass, working class political party. The SC has hundreds of members and supporters across the country who actively participate in the NDP at all levels. It persuaded the party to demand Canadian Forces out of Afghanistan in 2006. It played a pivotal role in launching the leadership review in 2016 that is forcing NDP federal Leader Tom Mulcair to step aside at the conclusion of the present leadership race in October 2017. The SC got the party at its 2016 federal convention to launch a national discussion of the Leap Manifesto. In April of this year it successfully pushed the Ontario NDP, at its convention, to embrace public pharma care, dental care, the re-nationalization of Hydro One, and free post-secondary education. In a federal leadership race dominated, so far, by the politics of identity, a race in which the political differences between the candidates are often blurred, the SC endeavours to put the focus on policy and on issues that matter most to the working class — to marginalized, alienated and disenfranchised people. To that end, it calls on all the registered candidates for Leader to answer the 10 Questions, directly, clearly and without delay. 1.The benefits of robotization and new technologies generally should be shared, not utilized to make the owners super rich and to drive more workers into poverty. Do you commit that under your leadership the NDP will fight for a reduction in the work week without a loss in pay or benefits? 2. About 235,000 Canadians become homeless every year, with 35,000 sleeping in shelters and on the streets on any given night. 1.7 million are unable to afford adequate, suitable shelter. Do you commit that under your leadership the NDP will demand the construction of half a million quality social housing units by means of a publicly-owned land assembly and housing construction enterprise? 3. For decades, NDP leaders have gone along with the New Cold War against Russia and China, and backed western military intervention abroad, including the bombing of Libya. Do you commit that under your leadership the NDP will demand that Canada get out of NATO immediately? 4. Do you commit that under your leadership the NDP will actively support the worldwide campaign backed by unions and parliamentary bodies to effect Boycott, Divestment and Sanctions against the Zionist apartheid state until its occupation of the West Bank ends? e) Increase income tax for earners with income over $200,000 to 40%, and for earners with income over $900,000 to 50%. 6. Do you commit that under your leadership the NDP will demand greatly expanded public ownership and economic democracy to include Canada’s railway system, major hydro, oil, gas and other energy corporations, the giant telecoms, and at least two of the major banks? 7. Do you commit that under your leadership the NDP will fight for a Green Industrial Revolution to shift rapidly from carbon and nuclear energy towards safe, clean and renewable energy technologies, and that this rapid transition be funded by conscripting the profits of big oil and gas, and put a high priority on the employment of displaced, indigenous and young workers? 8. For indigenous peoples, it’s time not just for “reconciliation” but restitution. If diamond mining corporations in the north can provide their employees world class housing, food, healthcare and recreation, they should do no less for Canada’s original peoples who deserve to share the wealth that has been plundered, or the resource extraction firms should face expropriation. Do you agree with that, and commit to a policy of No More Pipelines? 9. The NDP should be transformed from a mainly electoral machine into a vast social movement that fosters greater democracy. Do you commit that under your leadership the NDP will partner with unions and social justice groups, ensure more time for policy debate at its conventions, and make them more accessible rather than use them chiefly as a fund-raising exercise? Do you commit to end the present practice that allows party leaders to ignore adopted policies? Do you commit to increase funding of Electoral District Associations and put an end to top-down interference with local candidate nominations? 10. Do you commit that under your leadership the NDP will fight for a national Pharmacare and Dental Care programme, and a national $10 a day quality childcare service, to be funded by steeply progressive taxation? We want answers. 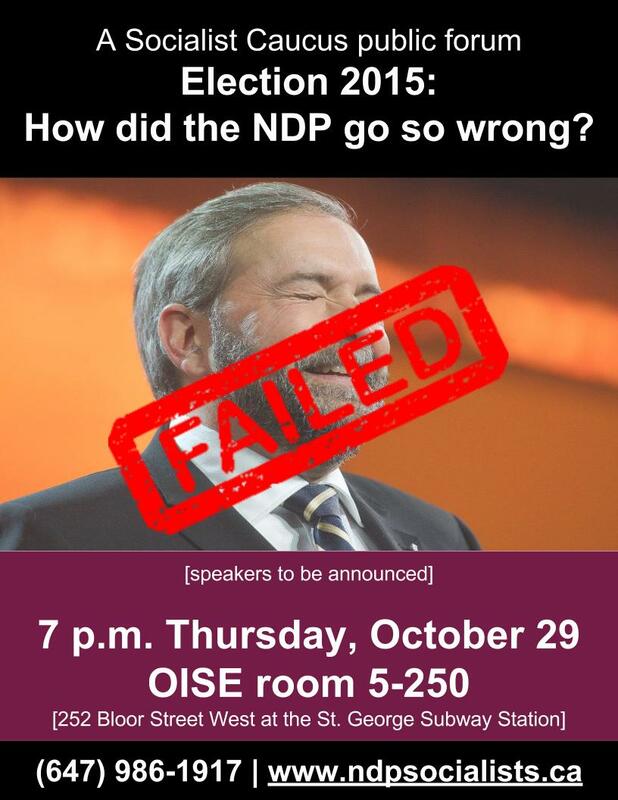 The NDP Socialist Caucus is posing questions to the registered candidates for federal NDP Leader because we think that party members deserve to know where the candidates stand – beyond vague generalities and broad slogans. Do you agree? Would you like to help? See the SC’s 17-point platform for socialist leadership at: http://www.ndpsocialists.ca/ &nbsp; Call us at: 647-986-1917.